2010: Rose Pression had a very good sales year with a nice sales growth. November – December 2010: Rose Pression is sold by VandB (a chain of bars/wine and beer cellars with +/- 35 stores). VandB Toulouse and Chateau Gontier sell our original beverage in bottle, 5L keg and 30 keg. July – August 2010: Rose Pression gets a national reference number with France boissons. The product is tested by France Boissons Aveyron. A test which turns out successful. December 2009 – January 2010: Rose Pression takes off to the Netherlands. A Dutch importer/distributor is interested in commercializing Rose Pression in the Netherlands. 22nd – 26th of November 2009: Rose Pression participates in the HORECA EXPO fair with its importer/distributor B-lite. Several distributors and bar owners discover the original wine based cocktails. Sales in Belgium increase every month. Rose Pression is sold in around 30 bars in the Antwerp region. September 2009: Rose Pression improves its packaging. The small 5L kegs are replaced by 5L kegs with integrated gas cartridge. The new 5L keg allows you to keep the products sparkling during 30 days after opening. Summer 2009 : Rose Pression is sold during several summer festival in the Lot, L’Aveyron, Le Lot et Garonne, Le Gers, La Corrèze et Au Cantal. Above that, the 2 cocktails take off abroad. Several bars and restaurants in Germany (Munich), Belgium (Brasschaat – Kapellen) started selling Rose Pression with big success. Meanwhile the Facebook fan page attains +/-1000 fans in 2,5 months. The 1st of May: The Bleu Pression is tested during Rose, Blanc and Bleu Pression night at AndCo Prayssac. The Bleu Pression was a hit. After less than 1 hour all Bleu Pression was sold out. The 18th of April 2009: Rose Pression is available in Belgium supermarkets. 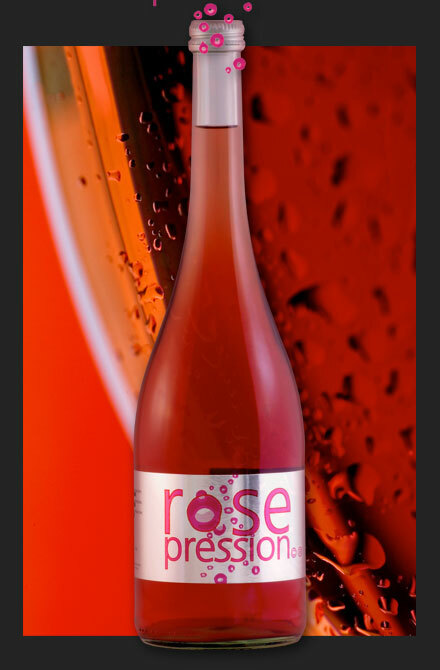 Van Ende Supermarkets in 2930 Brasschaat and 2940 Stabroek start selling Rose Pression. January 2009 – April 2009 : several bars, restaurants and supermarkets in the Lot discover the products. In the Lot and Garonne, Le Gers and L’Aveyron the summer festivals choose Rose Pression. The first reactions in Toulouse are very positive. January 2007: The firm “Rose Pression SARL” is founded to commercialize these two original cocktails. November 2008: Rose Pression SARL moves into the new 500m² site based in Prayssac. A new team is employed to industrialize the production and to develop the marketing strategy. July – August 2005: “Rose Pression ©®” and “Blanc Pression ©®” are served during festivals in the Lot region. May 2005: The two cocktails are protected by a copyright. 2003 – 2005: Thomas Beauvillain, oenologist in the Lot Region, develops two original and unique wine-based cocktails: “Rose Pression ©®” and “Blanc Pression ©®”. The tasting results are positive but the first consumer tests show that people don’t drink a lot of the cocktail because of its high alcohol percentage (12°). The alcohol percentage of “Rose Pression ©®” et “Blanc Pression ©®” is reduced to 6°.